Sanhe means three rivers in Chinese. Where these three rivers meet is some of the best forage or grassland in all of China. Sanhe horses are found in the northeast of the Inner Mongolia Autonomous Region and are used mainly for riding and pulling loads or carting. They are considered the most developed of the Chinese horse breeds. During the Liao dynasty, about 1000 AD, the region was known for the quality of its horses, some of which were sent to the emperors by nomadic tribes. During the Qing dynasty seven hundred years later, the Soulun breed was bred in this area. The Soulun were famous for their appearance and performance under a saddle. These horses were used as cavalry horses against invaders. During 1904 and 1905 Russian Zabaikal horses were brought through the Baikal and crossed with the local breed. Orlov and Bechuk horses were brought to the area in 1917 by Russian settlers to the area. 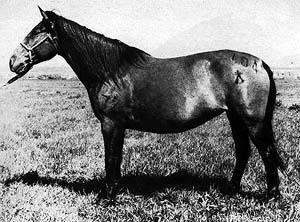 From 1934 through 1945 a stud farm was established by the Japanese with records of Anglo-Arab, Arab, Thoroughbred, American Trotter, and Chitran horses. In 1955 the Ministry of Agriculture of the Peoples Repulic of China began an assessment of the crossbred horses of the area and established two stud farms to develop a new breed under the name Sanhe. Sanhe horses are compact and muscular, taller and larger than the Mongolian Horse. They are stout, with a deep and long chest, good muscle, flat back, strong limbs, and colored in chestnut, bay, brown or black. They have a nicely sloping shoulder and strong joints. Their average height is 140 (57 inches or 4 feet, 9 inches) to 147 cm (4 feet 10 inches) and they weight 330 kg (330 kilograms = 728 pounds) to 380 kg (380 kilograms = 838 pounds). They have a willing temperament. Their hooves are strong. Sanhe is used for racing, saddle and harness work. They are extremely fast and can cover 1 km, a little less than a mile, in 1 minute and 10 seconds. When pulling a load of 500 kg (500 kilograms = 1,102 pounds) a single Sanhe can cover 10 km in one half hour!